One moment your feline companion is sunbathing in her cat tree, the sun is dabbling across her fluffy orange coat and then, you spot it. It can’t possibly be real. Is that..a.. FLEA? The tiny creature jumps quickly off the cat and disappears. Your cat seems completely unphased. You are in a panic. You have one cat. She doesn’t go outside. Not even on the balcony on your seventh-floor apartment. You don’t have a dog. There is no way that was a flea. Indoor cats don’t get fleas, right? Think again. This story plays out much more often than you would think. 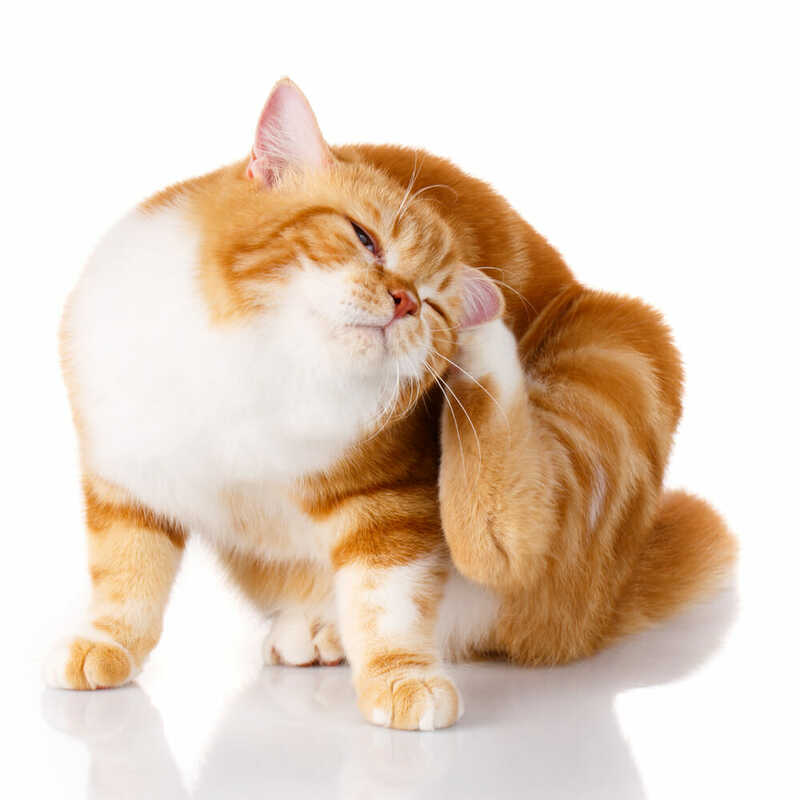 Yes, your indoor-only cat does have fleas, and here’s how. Fleas are classed as an external parasite (or ectoparasite), meaning they complete their life cycle on the outside of a host. In this situation, the host is your cat (or dog, rabbit, guinea pig, etc.). The good news is, fleas don’t live on humans – we don’t have enough fur! That still does not explain how on earth one of these tiny, blood-sucking ectoparasites made its way onto your precious cat. The most likely mechanism in this situation is what we refer to as a “hitchhiker flea.” This is the flea (or fleas) that hitch a ride on a warm body. It can happen from simply being outdoors, being around other animals, or around any other person who has animals at home (even if they do not have an active flea infestation). This hitchhiker flea hopped onto you, came into your home, and made herself comfortable. Had you not had any pets, the flea would be unable to complete her lifecycle and would die. However, your hitchhiker flea hit the jackpot – your cat. It is the “host” that the flea requires to complete her life cycle, which involves getting a meal (biting your cat), laying eggs which then turn into larvae, which then turn into pupae, which later hatch into adult fleas. One female flea that has a host can infest your cat in as little as one week. Before you panic! We as humans are geared to think of fleas as being “dirty” and “gross,” and finding out your pet has fleas can make you want to fumigate your entire house. But don’t worry – this is unnecessary. As mentioned above, fleas require a host to be able to complete their life cycle. 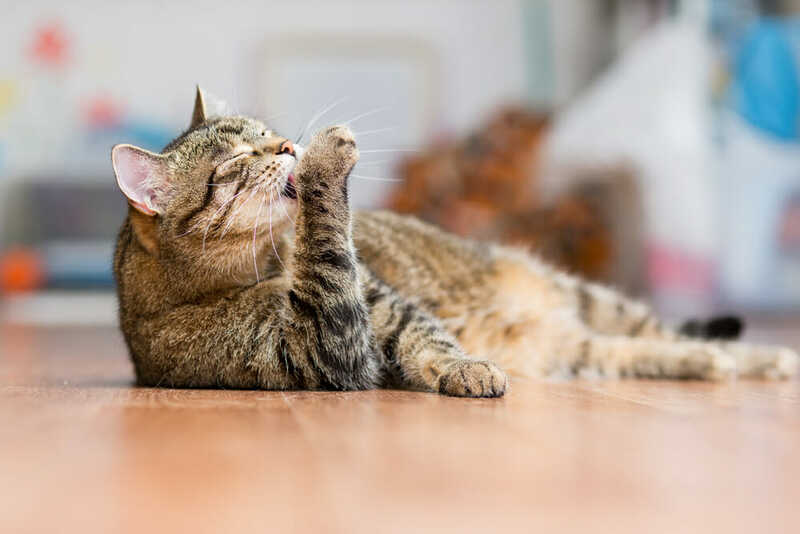 Once they are no longer able to do so, the fleas will die, and your fluffy kitty will stop scratching from flea bites and flea dirt. How do you ensure the fleas cannot complete their life cycle? It is where your veterinary health team comes into play. Veterinary clinics are knowledgeable about what products and doses are safe for each type of animal you require to treat. They can also advise you on different options (e.g. : topical applications, versus oral medications) that will work best for you. Veterinary clinics are the only place to purchase veterinary approved flea treatments, some of which are over the counter, others may require a prescription to be dispensed. Products not purchased from a veterinary clinic can be dangerous for your pet if it is not the right type or dose of a product. Most flea treatments work in the same way. They interrupt the flea’s life cycle in some way. For example, a common veterinary flea treatment is a topical, once monthly application, Revolution, which works to kill the female adult fleas so she cannot lay her eggs. However, an important thing to note is that there are different stages of the flea life cycle: egg, larva, pupae, and adult. To ensure the flea infestation does not continue, you must treat all pets in your home for three full months, to ensure the life cycle is disrupted, and no sneaky little larvae or pupae hatch into adult fleas down the road. It can take time, but it does work, and soon you are your feline companion will be flea-free. This same advice applies to our canine or other furry friends as well. Animals that do go outdoors are much more susceptible to getting fleas than indoor-only creatures, discuss with your veterinarian parasite prevention at your next visit to ensure you, and your pets are protected. Fleas can and do, happen to any pet, please contact us if you decide to seek treatment and/or prevention.